A significant portion of the shopping center known as Toco Hill(s) will soon undergo a significant renovation to update the center originally built in 1956. With regards to the investment in the property, Ann McCarthy, Communications Director for Edens, said, "We aren’t able to provide any details on investment amounts." Suffice it to say, I'd estimate the renovations to cost in excess of a few million dollars. Toco Hill(s) shopping center was built in 1956 by notable Atlanta developer Clyde Shepherd, Jr. Shepherd reportedly named the center Toco Hills in homage to the word "Toco," to which he was introduced in Brazil, and which he said translated to "more luck than you can imagine." 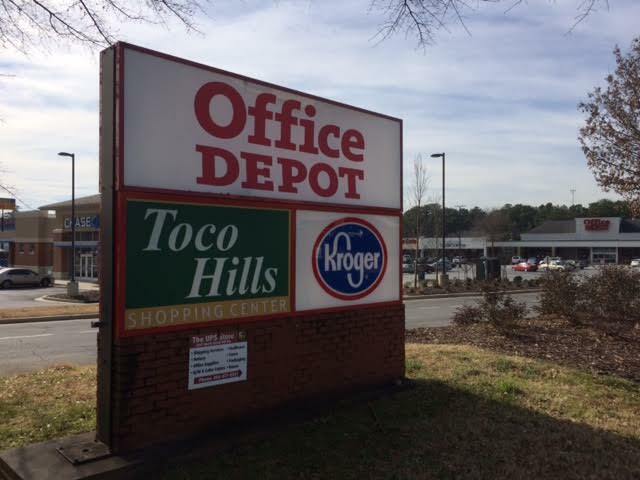 Edens already controlled the Publix-anchored Toco Hills Promenade and now controls the Office Depot-anchored portion that also includes Toco Giant, Bagel Palace, Shoe Center, Maggie's Neighborhood Bar and Grill, Famous Pub, Chris' Pizza and a host of other tenants, but not the Kroger or Pike Family Nurseries. According to the press release from last year announcing the transaction, "EDENS envisions bringing a cohesive feel to the shops and restaurants facing North Druid Hills Road through design and a diverse retail mix." McCarthy claimed she was unable to provide any specifics on the design saying, "While we don’t have specific details or renderings to share at this time, the design will complement Toco Hills Promenade." McCarthy went on to say, "We are taking steps to refresh the look and experience of the Center. We are beginning by investing in the infrastructure of the center from parking and enhanced outdoor spaces to new roofs. This work is underway and will continue this summer. Façade renovations will start this summer and wrap up before year-end." Images I viewed but am unable to share on this site reflect a far more streamlined appearance for the center a whole. 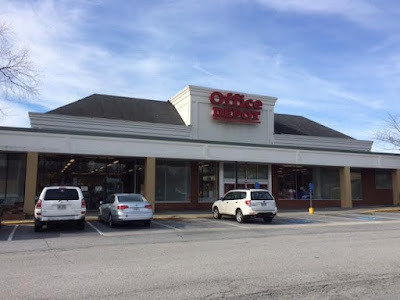 For instance, the former A&P raised roof where Office Depot is today located will be removed. The renovation will remove the "anchor like" look from the exterior signage and replace it with a more uniform look. The Office Depot signage will likely be increased in size and will be attached to a larger, single front portion of the storefront. Upscale French restaurant Petite Auberge, which has been a tenant in the center since 1974, will also see its exterior look significantly changed. The current exterior which includes green metal panels and three large windows will all be removed. Other tenants such as Toco Hill Giant Package Store, Shoe Center, Maggie's Neighborhood Bar & Grill, Famous Pub, and Georgia Department of Labor are likely to see the exterior of the space improved with mortar replaced, panels replaced and windows cleaned / replaced. 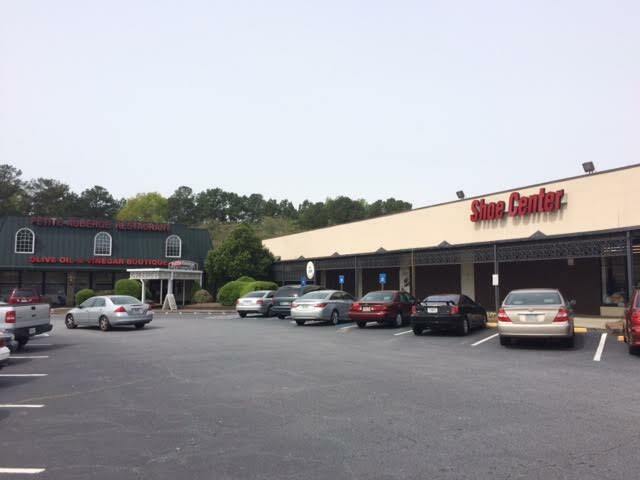 Another source with knowledge of the plans indicated Edens plans include, "Revising driveway connections to North Druid Hills Road, modifying parking lot striping, adding landscaping and sidewalk areas, revising site lighting and improving/adding drainage structures." That same source indicated that, "These proposed improvements will require the demolition/replacement of existing curb & gutter asphalt, and existing light poles." Despite there being no visible work being done, McCarthy went on to say, "Efforts are underway with Toco Hills Shopping Center." Are you excited for the upcoming renovation at Toco Hill(s)? What would you like to see open in the center? What is your earliest memory of Toco Hill(s)? You may consider it mundane but fixing the parking lots to make them easier to enter, navigate and exit will be the best improvement. Every time I have to drive across the parking lots, I say a prayer for safe passage. I'm with Unknown on the parking lots and lanes. I would also NOT change the entrance to Petit Auberge. The type of restaurant lends itself to the decorative outside, and to make it conform would change some of the ambience. Was also thinking that I like the old-school look to Petit Auberge. I fear it's all destined to have that exact same beige fake stucco look, only with different illuminated letter fonts. Horrible lot with strange one-way lanes. I think I've never in my life been to any of the upstairs places at Toco. Maybe they can put something with some allure in one of those spaces. Was in Shoe Center yesterday and the scuttlebutt is that they are closing for good. (Clearance sales have begun.) Which begs the question: wonder who will be new tenant? I'm with unknown. Whenever I go to that parking lot I feel like my head should be able to spin around like Linda Blair in the Exorcist. Cars and people come at you from every direction! The best improvement would be to add elevators to get to the second floor! Does this include where The Music Class is? So tired of having to carry scared and heavy toddler up those stairs all the time. I agree about Petit Auberge. If I were the restaurant owners I would be very upset about losing the entrance and the reduction of ambience. I hope they reconsider. The last time I let sign ambiance trump my dining decisions I ended up at Alfredos and Mary Macs and I left with a very challenged pallette and feeling like poo. I'll add Petite to the nobody cares category. close it or make them conform to tan stucco. Petite has been there for over 40 years despite a less than stellar location. I don't think it's because of the outdoor ambiance. I could be wrong; but, I heard "TOCO" was an acronym for "Top of the County". Sat over at Goodyear today watching people turn in and out on the wrong side of the road between Suntrust and Chase today. What a mess! They managed to work it out without making contact, somehow, but there were three close calls in 5 minutes. Second the prayer for improved navigation of the lots. We ALL say a prayer when driving through but on the other hand, where will I go for a heart beat raising adventure? The "Top of the County" myth has been debunked. That area isn't the highest point of the county by a long shot.